Justify after winning the Kentucky Derby (photo by Jordan Thomson). Fans took the news that Triple Crown winner Justify would be retired way too well, in my opinion. Not that this news was unexpected. As soon as word first broke on July 10 that Justify had swelling in his left front ankle and was taken out of training, I predicted on my blog that this would be a convenient excuse to end his racing career. Why? Justify’s $75 million breeding rights. It made retirement an easy decision. Risk avoidance — the cost of insurance to keep the undefeated colt on the track outweighed any perceived benefits. Retirement was purely a business decision made by an ownership group that cares more for the bottom line than it does for race fans and/or the future of North American horse racing. Although the timeline for Bob Baffert having 60 to 90 days to train Justify for the Breeders’ Cup Classic may have been a bit tight, I am not buying that was the reason Justify’s racing career is now over. 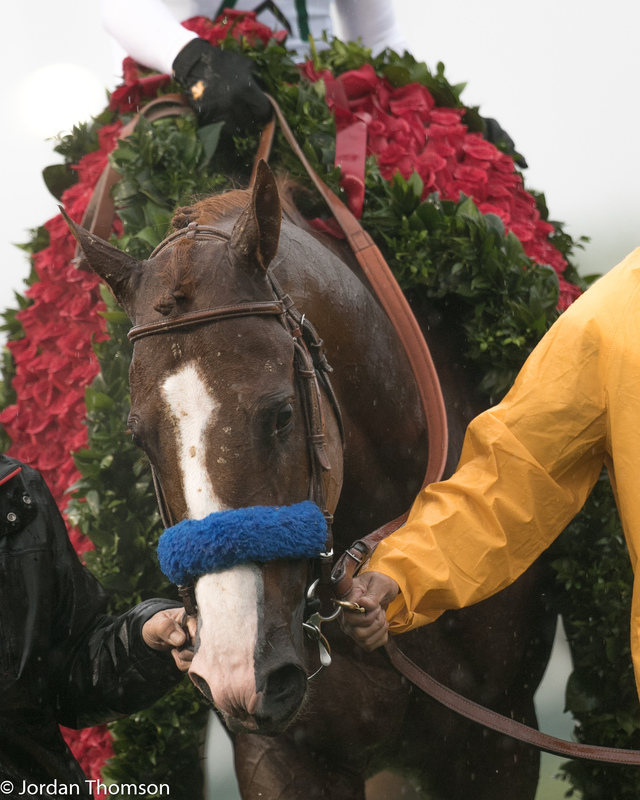 I think the ownership group used Baffert as a front-man, relying on his respect and charm to sell the public on the premature retirement of the Triple Crown champ. He did a good job, apparently, as the “they did the right thing” crowd sang his praises. Bolshevik! Even if prepping for Breeders’ Cup was sketchy, there was still the richest horse race in the world — the Pegasus World Cup — in January. Needless to say, my appreciation for American Pharoah’s owner Ahmed Zayat has grown even more (it was great already), as Zayat never considered this option for Pharoah. If I ever see Zayat, he’s is getting a huge hug from me. Wake up horse owners! Frank Stonach did you a favor. He’s opted to be part of the solution. Stonach created the Pegasus World Cup event to help the sport of horse racing — to keep stars of the sport like Justify around a little longer. And guess what? It doesn’t interfere with the breeding season which runs from Feb. 15 to July 1. I am going to put this bluntly: The Sport of Kings is killing the Goose that laid the Golden Eggs. At the turn of the 20th century, the sport of horse racing was one of the top three sports in the US, along with baseball and boxing. Go back several decades earlier (before there were polls) and horse racing was probably the most popular American sport, as horse tracks like Fair Grounds (1852) and Saratoga (1864) are a couple of the oldest, more well-known sporting venues still operating today in North America. After booming at the beginning of 20th century, the sport of horse racing, for a variety of reasons, faded towards the end. The latest Harris Poll shows that only 1% of Americans call horse racing their favorite sport. The sad part is, although fallen and faded, America gives this sport signs that it wants it to come back. Witness the 2015 Kentucky Derby that I attended with my son, which featured a record crowd of 170,513. However, this sport keeps shooting itself in the foot and hasn’t come up to speed with how it treats its customers. If you read one of my previous US Racing articles “How I Became a Fan of Horse Racing” you will know that I have experienced some of the best of all professional sports. I also have an MBA degree, so I am not stupid or naïve about marketing and business. But it needs to be said, this sport is a rudderless ship with no commissioner that is totally clueless how to bring fans back. The sport of horse racing could be so much more with proper vision, common sense and marketing. It pains me, as someone who loves this sport and is so passionate about it, to see it eclipsed by a sport that was once nothing more than a gym activity created by a Canadian doctor (basketball). But the Michael Jordans aren’t retired after their sophomore season to become baby daddies. The NBA, despite its prima donnas and its share of negatives, still is more popular than the sport of horse racing. Why? Because fans come out to see its stars. This is where the sport of horse racing needs a big kick in the groin. $75 million Benjamins for breeding rights? Ludicrous, foolish spending. Look at Secretariat, arguably the greatest race horse of all-time: he sired 663 foals and only 8.1 percent of them were stakes winners. Only nine were Grade 1 winners. Top this off with the whole experience at most horse racing venues, where they can’t handle large crowds. Case in point, the 2016 Breeders’ Cup World Championships at Santa Anita Park. I spent nearly a grand for two race tickets, long lines for everything (bathroom, concessions, betting) and they run out of bottled water, food. Worse, it took two hours to get out of the parking lot. Not to mention that it was a fire hazard wading through the crowd to even get to the concession stands. Factor in the security and ticket-takers who didn’t know what area one’s ticket allowed one to go and it was a very disappointing experience. In the late 1990s, I had front row tickets to see Mario Lemieux with the Pittsburgh Penguins play in Phoenix against the Coyotes. For $250 a ticket (face value), I had waiters in tuxedos come to our row and take orders for concessions we wanted, along with receiving a free program. In St. Louis for Blues hockey games, buy tickets in the first three rows and you get a free all-you-can-eat private buffet, with some decent, gourmet food, as well as a free program. Docking stations for cell phones are also becoming more commonplace at sports venues. This is what other sports do today to attract and retain fans, especially the younger generation. Come up to speed with technology. Get with the program! Mike Smith aboard Justify after winning the Kentucky Derby (photo by Jordan Thomson). If the sport of horse racing has any glimmer of hope of succeeding in the future under the current dynamics, jockeys are a huge key. My experience around jockeys has been very positive. They were all nice and chatty and accessible to fans. Jockeys are a real credit to the sport. Jockeys are also vastly underpaid. When I see the huge dollars thrown around foolishly in this sport for breeding rights and yearlings, jockeys need to be paid more. And the sport needs to market more around them. 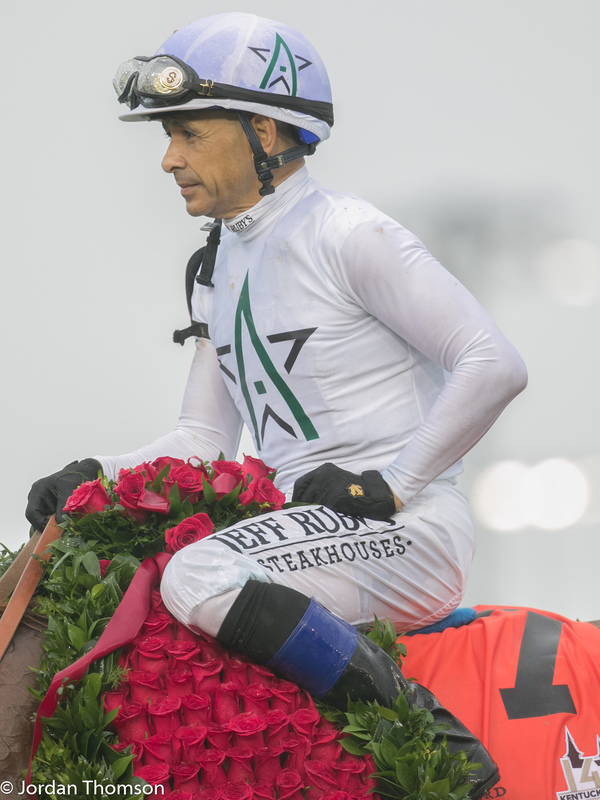 Jockeys risk their lives for a sport we all love (get well soon Victor Espinoza). And jockeys are the only real continuity this sport has. Perhaps the good news on the horizon is the recent Supreme Court ruling. Back in May, the Supreme Court struck down a federal law that prohibits sports gambling outside of Las Vegas. This ruling now gives states the go-ahead to legalize betting on sports. This means that the sport of horse racing will now be forced to compete in the future or it will fade even more into oblivion. With gambling on any sport, especially NFL football, so easily accessible to every American, the sport of horse racing has just received a huge wake-up call to make the necessary changes to survive. Otherwise, purse money, attendance, TV ratings are going to decline. Why? In the future, every Joe American will now be able to go online and bet on any sport. More importantly, Joe American will be able to go to a casino nearby, watch a stick and ball sport at the casino’s sports bar, bet on the game and, then, immediately collect if he wins — just like at the race track. I love the sport of horse racing. I want it to return back to the level it once was when I became a fan in the 1970s. I am optimistic that it can get close again. Money rules and ruins sports like many other things. The sport of horse racing has been backed into a corner for some time now. The sport has enough good people with intelligence in it that it will make necessary changes to survive — even if returning to its former glory is just a dream.